Materials, organisms and methods used in molecular biology can pose dangers to the individual researcher. However, regulatory frameworks are in place to address these risk factors, enforcing standards of practice which minimize the risks and enabling generally safe laboratory environments. In the pursuit of our project, the iGEM team Freiburg 2017 complied with all applicable safety regulations and guidelines. iGEM team Freiburg 2017 member loading a midori green stained agarose gel in a designated gel area. All team members received general lab safety instructions by Dr. Nicole Gensch. This included usage of protective equipment, safe behavior in the laboratory and emergency procedures. 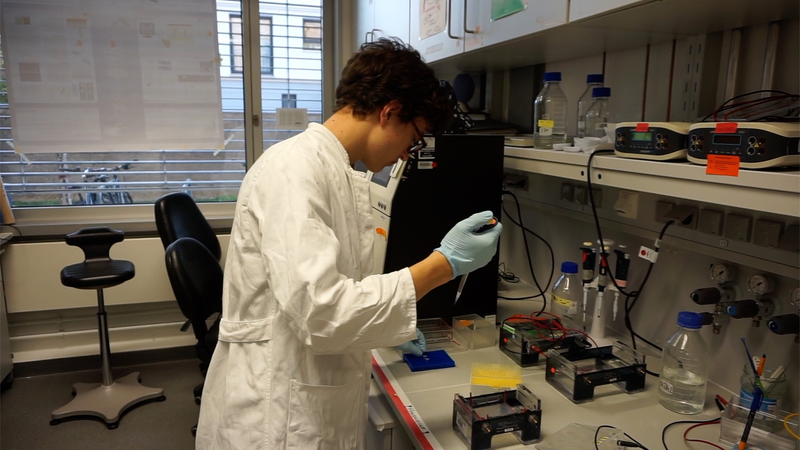 For generation of stable cell lines, lentivirus production and infection of cells was performed in an S2 (German biosafety level 2) approved area of Prof. Schamel's laboratory at the BIOSS. Team members working there, were provided with the required safety training. S2 work performed with special safety precautions by a team Freiburg student in a S2 approved area. Our work with genetically manipulated organisms was appropriately documented to fulfill S1 (German biosafety level 1) standards and was applicable preregistered with the regulatory government agency (Regierungspräsidium Tübingen) and approved for S2 in accordance with the genetic technology law (Gentechnikgesetz, GenTG). Furthermore all requirements of the iGEM competition concerning safety were fulfilled. The required safety form was completed and as our project involved parts not on the whitelist, applications were submitted for these parts.